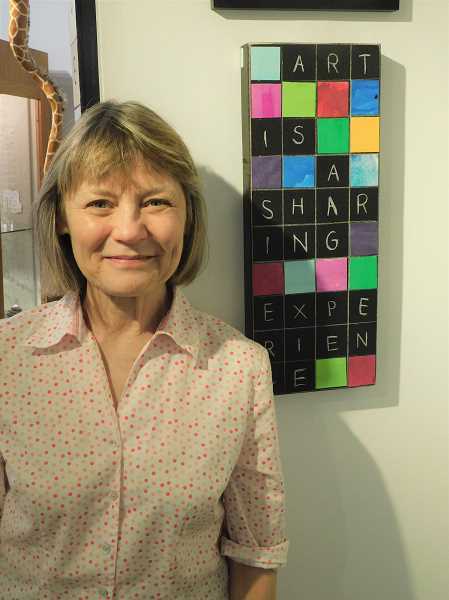 Nina Bradford is inviting Spiral Gallery visitors to think about puzzles. Bradford's show "Words, Lines, Color," which will be featured at the gallery in June, features several pieces that resemble crossword puzzles. There will be an opening reception for the show from 6-8 p.m. Friday, June 1, at the gallery, 341 Broadway Street. The contents of the designs in "Words, Lines, Color" are anything Bradford has found inspirational in her day-to-day life. "For years, I've filled notebooks with written words, phrases and ideas — anything that I find interesting," she said, noting that several of the phrases were inspired by signs she saw while driving through a small town in central Oregon. Bradford has been working on the collages in "Words, Lines, Color" for the past year and a half and is happy with the finished products. "I like that they're full of ideas and full of color and patterns," she said. She added that themes found in the "Words, Lines, Color" pieces include "positive philosophy and living in changing times." "They make you think about things," she said as she discussed the pieces and the meaning they hold. "I love positive philosophy, and (the idea that) if you give more you get more." Her favorite piece in the show is "Rubber Meets the Road," a giant crossword puzzle collage that takes up most of a wall in the gallery's showroom. "I like to work on big things," she added. Bradford likes that many of the collages are puzzles. "Every time I make art, I try to communicate something new," she said. "If it's a puzzle it captures the viewer and maybe makes them linger a little longer to figure out what it says." For Bradford, creating each piece of art is sometimes a puzzle, so she noted it's fitting that many of the finished products are visual representations of this. "I like having ideas and figuring out how to do them," she said, discussing her process. "Trying new and different things and figuring out how to do them is like a puzzle."